Free breakdown cover on i MiEV | What Car? 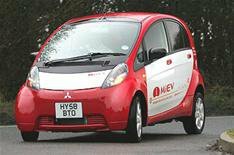 If any of the 25 new owners of an electric Mitsubishi i MiEV were anxious about its reliability, they can now relax. Mitsubishi has signed a deal with Mondial Assistance to support the launch of its fully electric supermini. That means there's a national network of i MiEV-trained technicians ready to provide roadside assistance. The Mitsubishi Assistance Package comes as standard on all new Mitsubishi vehicles for three years, and provides Europe-wide cover. Currently, the 25 i MiEV models on UK roads are taking part in the West Midlands CABLED trial (Coventry and Birmingham Low Emission Demonstrators). Cars are not likely to reach showrooms until later this year.